Listen to this feature here. Host introduction: Spring is here and the garden is calling. Often times, we answer the call with fertilizers and lots of water. But many people are looking for green alternatives to landscaping. Sueann Ramella reports on a green alternative many gardeners are excited about; Xeriscaping. Sueann Ramella: What do you need to grow a beautiful garden? A green thumb helps but you need soil, [ Sound: digging in soil] or substrate, some plants or seed – hopefully a plan and water [Sound: water from faucet] Lots of water…[Sound: water gets louder] depending on the type of plants you choose and the climate you live in. By the way, you are most likely using… [Sound: gulping water] drinking water to irrigate your gardens and lawns. In Spokane, the average family triples their water usage in the hot summer months. Most of that water is used outdoors. Bill Rickard is the Water Quality Coordinator for the City of Spokane. Bill Rickard: We have a lot of water, but not necessarily so much that we can waste it. Water use in this area tends to be more acute in the summer. Any urban area, and Spokane is no exception, uses several times more water during the summer; half of all the water that you use all year. So we want to work together to responsibly use our water resources. Ramella: So what can be done to grow a beautiful garden, and reduce the amount of water used to sustain it? Kathy Hutton: Xeriscaping is great because everybody’s is going to be in a water crunch right now. Ramella: Kathy Hutton is with Plants of the Wild in Tekoa, Washington. Chuck Cody: Well, first of all plants are not boring. There are many, many plants that are native throughout the Western United States that are very exciting! Chuck Cody: Xeriscaping can be many things though. I mean, it can be a rock garden where you put a lot of succulents or potentially even cacti. There are some cacti that will work in our area. Sueann Ramella: Many organizations and cities are encouraging people to xeriscape. Plants of the Wild, along with The Washington Department of Ecology, WSU Extension and the cities of Spokane, Post Falls and Coeur D Alene distributed information on wild flower mixes and low maintenance grass seed to residents. Kathy Hutton: Spokane and Coeur D Alene realize they are going to have a problem with conserving and rationing water. So they are trying to educate the public on options other than putting in a typical lawn. There are options out there and just giving them some information on some different alternatives. Ramella: Learning about the types of plants and how to design a xeriscape garden is easy. It just takes a little time and a willingness to change old gardening habits. Kathy Hutton says there’s a growing number of people looking into xeriscaping. Kathy Hutton: I think people are beginning to change. We are having a lot more people calling that are interested in xeriscaping and native landscaping and even our turf mixes, which we call our low maintenance mix, where they don’t’ want to put in much water, fertilizer or even as much time. They want it to be low maintenance for them. Sueann Ramella: For more information on xeriscaping, including photos of drought tolerant plants come to Our Northwest at nwpr.org. Washington Department of Fish and Wildlife's Wildlife Areas page. Water leaks are our biggest conservation problem around the home. In fact, as much as 13 gallons can be lost in one day by one leaky faucet. Washing your car at a car wash is smart because carwashes recycle their water! Switching to a frontloading washer can save hundreds of gallons of water each year. Learn how to repair leaks, how to use smart landscaping and more at this great site from WSU. If It's Yellow, Let it Mellow and Other Conservation Tips! Landscape gardening and toilets use the greatest amount of water in and around your home. During the summer 40 percent of municipal water is used for outdoor irrigation. On hot days as much as 3,000 gallons of water PER DAY PER HOME can easily be consumed. So, these are two areas where you can easily conserve. In the 1960s and 70s, people placed bricks in their toilets. Do you remember the slogan "If it's yellow, let it mellow; if it's brown, flush it down"? Well, the same is true today. Many families are adopting the "number two flush" as a way to conserve. If you are too delicate for that, think about a low flow toilet. With new technology and improved low flow flushing, these items are much more consumer ready! You may end up with lots of money in your pocket at the end of the year! The city of Pullman offers rebates for efficient toilets. Check to see if your town has a toilet rebate program (2 flush toilet photo, courtesy jayallen). Back to the "mellow yellow" idea: if we follow this mantra, we might save around 10 gallons per day of usable water. With 300 million people in the U.S we could save 3 billion gallons of water every day. Use an efficient irrigation system (like drip hoses) and pay attention to when you water: early in the morning is best. One long soak is much better than several light sprinkles. Mulch around your garden. This will help your plants retain moisture AND keep the weeds down, so you aren't tempted to use pesticides. Remember: those weeds are competing for moisture as well as garden space! Consider a smaller yard or just letting it go brown as the season heats up. Plant native plants that don't need irrigation once established. Divert downspouts so that they go out into the yard or garden. Better yet, install a simple rain barrel (see below!) to help with your watering needs. Think about a grey water irrigation system for your home. Thanks to WSU, State of Washington Department of Ecology and the Washington State Department of Health for these tips. Have you thought about placing a rainbarrow or two around your house? It only takes a few minutes and can save you hundreds of dollars over the course of several summers. Picture taken by Hari Krisna from This Old House Magazine. Saving rainwater can be an efficient and inexpensive way to bring our water bills down and reduce the amount of water we're letting back into our storm drains and on to our sewer systems. There's another great benefit: rainbarrel water is soft; it doesn't contain metals or additives that are prevalent in some city supplies. 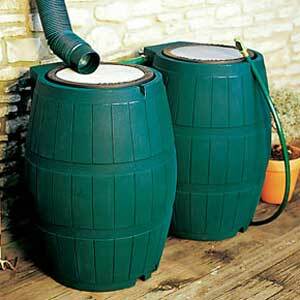 Rainbarrels can be made from a number of substances: food-safe plastic, wood or metal. You can paint them to blend in with your landscape or use them as creative canvases! Check out the rainbarrel guide. For complete rainbarrel plans, photos of rainbarrels, water saving trivia and links to other rainbarrel sites, click on this site from WSU's Master Gardener/Master Composter program in Whatcom County.